1. Why Choose Artificial Turf for Your Lawn? Synthetic grass, installed correctly, can provide you with a beautiful lawn without the hassle and expense of trying to maintain a problem-plagued natural lawn. Quality synthetic turf has become a proven landscaping alternative to natural lawns. You eliminate watering, mowing, fertilizing, chemicals, re-seeding, pests, allergies and muddy paw prints….all for a lower overall cost in the long run! 2. What Makes our Turf Product Different From Other Artificial Turf Products? To begin with, not all turf is created equal. Garden Environments uses Easy Turf, which is considered by most, to be one of the best constructed turf products on the market. The touch and feel of the blades are by far the softest. The construction standards, quality of the product and its related durability has led to it being the choice for professional grade artificial turf used by the NFL, Major League Baseball, NCAA colleges and high school sports teams. The primary difference in a few products from the rest of the market is simply the standards by which these products are manufactured. 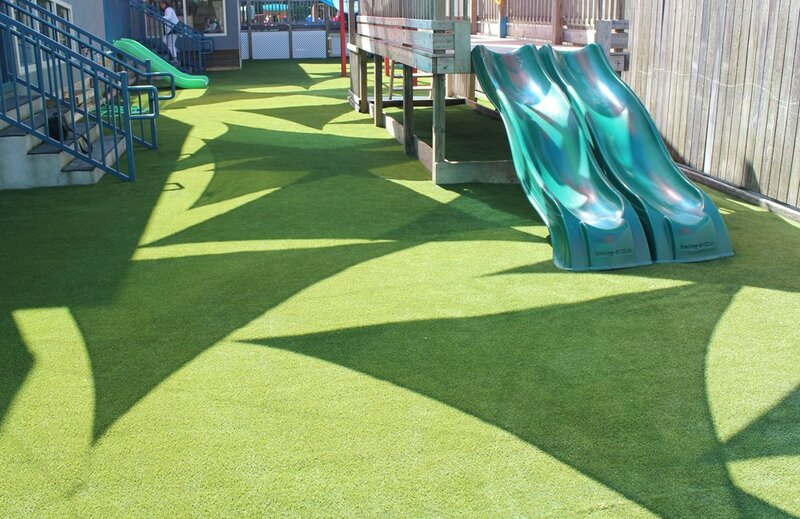 We only install products that meet or exceed minimum standards for research and development, ISO 9001 quality and ISO 14001 environmental as well as STC (Synthetic Turf Council) guidelines. A large number of turf manufactures don’t meet these standards; as a result Sunburst does not carry these inferior products. 3. What Should I Look for in Artificial Turf? Make sure the turf you choose fits your application and at a minimum meets the quality standards required for a life cycle of 20 years. As low-cost competitors flood the market with similar looking products – it’s only after they have been in the ground for 3-5 years you can start to notice the difference – not the first day they are installed. If you have pets or live in an area with poor drainage, the material you choose can make the difference. Hole-punch, hot-melt, channel or perforated backings can all drain differently in the long run. 4. There are Several Companies Selling Synthetic Turf. Why Would I Choose Garden Environments ? Garden Environments only install the best products available on the market, our distributor offers one of the industry’s best warranties, all combined with proven customer service. 5. Is It Dog Friendly? Put it this way…you can enjoy a dog AND a beautiful lawn! Liquids drain right through and droppings can be picked up as they would be with regular grass and/or washed off with a hose. 6. Can You Perform Other Jobs? Yes. Garden Environments has been in business since 1993, and because of our years of experience we are able to offer an array of services. 7. What About My Kids Playing on Artificial Turf? Kids love it! EasyTurf products are softer, safer and more durable than real grass. Our infill products are non-toxic and will in no way harm either children or pets if swallowed. Some consider it their own personal sports field! Parents love the fact that there are no more stained pants and scraped knees! 8. How Tough is it Really? Simple answer… consider the fact that FieldTurf is being used by thousands of sports teams for their playing surfaces. It is also used by many child care and pet facilities. If it is durable enough for them, imagine how well it will work in your yard. Most of the products we install are designed to last 8-10 years in a sports field application with constant abuse. Realistically, you should expect the products to last a period of 20+ years in your yard. 10. Why Doesn’t it Fade? The products we use have built-in UV protection that allows it to hold its color even under the most brutal conditions. Independent studies show that FieldTurf will fade at a rate of much less than 1% per year. This means that after ten years in direct sunlight, any color change will be imperceptible to the human eye. 11. How Well Does it Drain? EasyTurf has a proprietary backing, MaxxFlow – that drains better than anything else on the market. Coupled with the crushed stone base, it is a superior drainage system for your lawn or pet area. Unlike most other companies, Easyturf does not drill holes in its backing to allow for drainage. As a result, these MaxxFlow products are a superior choice for pets. We haven’t come across anything that can stain it yet. Even paint can be softened with paint remover and rinsed off. Sticky spills should be hosed off to prevent them from attracting dirt and bugs. 13. How Hot Does the Grass Get? The grass does not stay as cool as natural grass which has water running through it, but it will not absorb or radiate heat like pavement, rock or brick. It can be cooled down with sprinklers if needed. 14. What Kind of Maintenance Does it Require? It's more the matter of keeping it clean than maintenance. On occasion, a perimeter weed treatment may be required. Depending on your unique situation some weeds may grow on top of all these products. You can easily remove organic materials from the surface by using a leaf blower. Rakes may be required for moving heavier objects. A stiff bristle broom can be used to “fluff” the high traffic areas worn from use. 15. How Does it Affect My Property Value? Several of our customers have sold their homes and reported that their synthetic lawns added tremendously to the sale-ability of the prospect of purchasing a home with a beautiful lawn that required little to no maintenance. 16. What About Quality Control? Our commitment to customer satisfaction is second to none. We have plenty of happy customers! All of our installations are completed by trained installers, which allow us to maintain a consistently high level of quality. All of our projects are supervised and we only use the best equipment available. 17. How Long Does it Take to Install? The average landscaping area might take 2 to 3 days. Each installation is customized, so it is hard to determine this without a site visit. 18. How Much Does it Cost? Think of it as an asset and investment that will increase the value of your property. Best of all, unlike most home improvement projects, artificial grass will pay for itself in a few years! For instance, say you spend $200 per month on landscaping and watering costs, which equates to $2,400 a year. Over five years, your cost is $12,000. The average turf lawn can be installed for less than this! 19. Does You Offer Financing? We do not currently offer monthly installment payments, but we do accept credit cards and will break up the payments in phases. 20. Does it Come With a Warranty? Yes, Easy Turf offers awareness covering fading, discoloration, and problems with materials and workmanship.